The one thing you can say about this President is that he has an impressive sense of timing. Unfortunately it tends to be bad timing. First there was the disastrous meeting with the Russians in the wake of his firing former FBI Director James Comey. The optics could not be worst . . . until the meeting got worse with the alleged disclosure of code name intelligence from an ally. That meeting was held at the request of Russian president Vladimir Putin and then the Russians releases pictures taken by its state-run media organization, Tass, to the embarrassment of the Administration. Now, after Trump has threatened to cancel daily press briefings and change libel laws to allow easier lawsuits against the media, he is meeting with one of the one of the world’s most authoritarian figures, Turkish President ­Recep Tayyip Erdogan. Trump was previously criticized for calling Erdogan to congratulate him for acquiring near dictatorial powers in a close referendum. The last leader that anyone would want commiserating with Trump at this moment is Erdogan who has arrested journalists and critics alike in a crackdown on free speech and the free press. Erdogan will be trying to get Trump to reverse his decision to arm to Kurdish fighters who remain the most effective warriors against ISIS. Trump wants to supply small arms, machine guns, armored vehicles and other military hardware to the Kurdish fighters from the People’s Protection Units (YPG). Erdogan views the Kurds as a threat and has classified them all as terrorists. While Trump is unlikely to reverse the decision, there is a concern that he might give up Fethullah Gulen a cleric and critic of Erdogan. Erdogan has wanted to arrest Gulen for years and most recently accused him of complicity in the attempt coup against him. He has used the coup to arrest all of his perceived opponents and fire tens of thousands of teachers and others in his rollback of civil liberties. Hopefully, Erdogan will not give Trump advice on how tranquil life has become as Turkish leader after he eradicated protections for the free press and arrested people for the exercise of free speech. Ironically, while (he later insisted that he did not refuse), there are many sitting in Turkish jails who would wish he would avoid the hand of Erdogan. The fact is that Turkey remains an important ally in the region. However, Erdogan has destroyed the secular traditions of that country and introduced increasing Islamic influences over the government. While Trump cannot be criticized for meeting with him, he should not give up with the Kurds or Gulen to please this aspiring dictator. LOL! 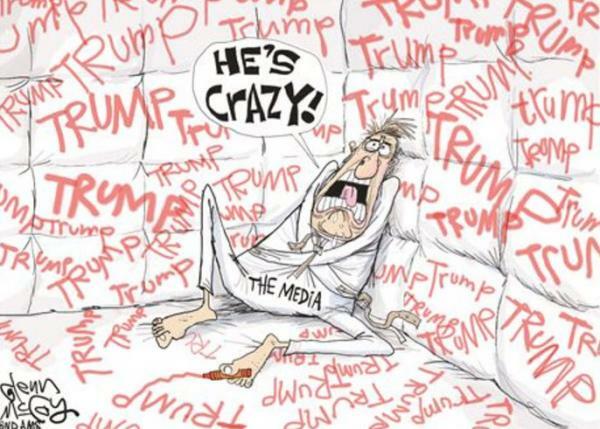 Branco is the best! No, no, no Squeeky, this time it’s differe….oh wait. Well, when Obama did it he was already a seasoned politician and knew what he was doing. Trump clearly is unseasoned so he doesn’t know what he’s doing. 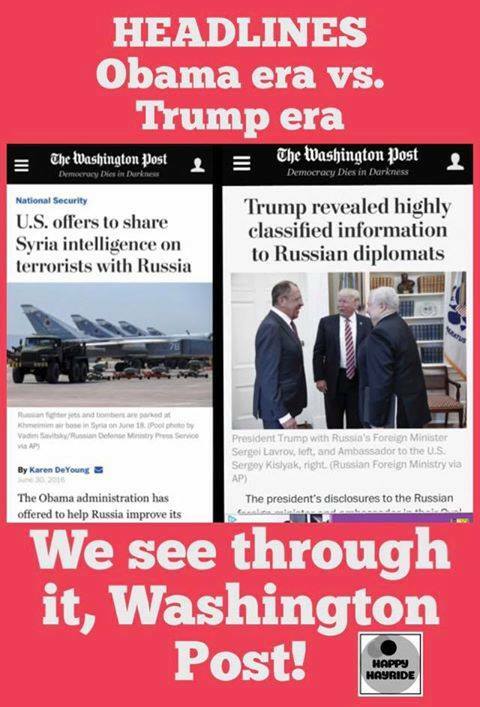 Anybody who reads this, and still tries to maintain that The Washington Post is a credible news source, is full of sh*t.
Absolutely. No one with any amount of critical-thinking skills and a smidgen of humility would come to any other conclusion. Shhh, don’t tell anyone! We wouldn’t want this to get leaked to the media and jeopardize national security, or something like that. Panetta reportedly revealed the name of the Navy SEAL unit that carried out the raid and named their ground commander at a ceremony where “Zero Dark Thirty” writer Mark Boal was in attendance, according to a report by the inspector general at the Department of Defense. Panetta reportedly assumed all 1,300 people in attendance at the event had adequate security clearances to hear the top-secret information about the Seal Team 6 raid, according to Politico. The report detailing Panetta’s oversharing flies in the face of the Obama White House’s claims they had never shared any classified information with anyone they shouldn’t have. 2. That time an Obama defense official leaked secret information about Israeli military operations against Iran. As Ben Shapiro pointed out, “An anonymous ‘US defense source’ [leaked] to the Times of London that Israel had cut a deal with the Saudis to use their airspace to strike Iran. The deal [was] scuttled.” The official leaked the classified information of key ally Israel in June 2010, just as the Obama administration was gearing up to take a harsher stance against the Jewish State’s settlement building activities. In 2010, Gen. James Cartwright, then vice chairman of the Joint Chiefs of Staff, allegedly leaked to reporters classified information about cyber attacks on Iran’s nuclear facilities. He reportedly shared documents about a highly sophisticated virus used to foil Iran’s nuclear program to members of the media, but there was no outrage from the press about these disclosures. Cartwright pled guilty last October to giving false testimony to FBI agents about his involvement in the leaks, only to be pardoned by President Obama days before he left the White House. Yet this got very little air time on cable news channels. His reckless action put at risk the lives of every member of SEAL Team 6. The Taliban and other jihadists eager to avenge bin Laden now knew which unit to target. Stunned and shocked, SEAL members immediately realized they were going to be hunted by al Qaeda sympathizers. Karen Vaughn, the mother of slain SEAL Aaron Vaughn, says that within hours after Mr. Biden’s comments, her son called to tell her to wipe away every piece of information regarding the family on social media, Facebook and Twitter. “I never heard Aaron that afraid in his life,” Mrs. Vaughn said in an interview. “He told me: ‘Mom, we’re picking up chatter. We’re not safe. You’re not safe. Delete everything.’” According to Mrs. Vaughn, Mr. Biden essentially placed a bull’s-eye on her son’s back — and that of all the other SEALs. He leaked classified information. SEAL Team 6 is a covert unit, which is supposed to operate in the shadows. This is how they are able to conduct deadly raids on terrorist groups. If Obama (8th year in office) did what Trump (5th month in office) has done, then why should Obama get a pass and Trump be lined up for impeachment? WASHINGTON — A House Republican wants to see the entire memo from former FBI Director James Comey on President Trump asking him to drop the investigation of Michael Flynn, as well as any memo Comey might have composed on the infamous meeting Bill Clinton had with Obama Attorney General Loretta Lynch. “If the New York Times has [Comey’s memo] that means we’re going to be able to see it and I would assume that would be fair. 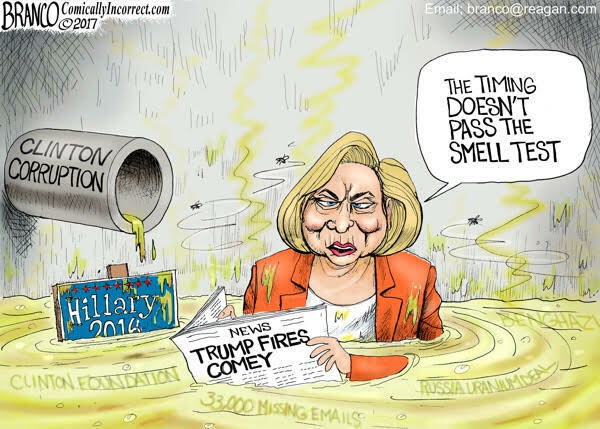 I assume that Mr. Comey also kept, if he’s disturbed by the same memos, that he gave to or about when Mrs. Clinton’s husband appeared in the jet with the attorney general,” Texas Republican Rep. Pete Sessions told The Daily Caller Tuesday. No, truly believable. Unless of course you’ve been living under a rock. This sort of thuggish behavior has been happening on American soil for quite some time now, ever since the Left’s war on civility and free speech began to flourish under Obama’s ‘divide and conquer’ strategy. Erdoğan’s bodyguards’ beat up protesters in D.C. while Turkish leader met Trump at White House. What’s your point Anon? Or couldn’t you find a tweet to make your point? So many accusations, so little proof. Funny how Trump’s tax returns were and are “top secret” to the American electorate, and yet he is casually sharing ISIS intelligence with the Russians. Please cite the constitutional requirement for a candidate or president to publicly release his tax returns. Someone stupid this way comes. . .